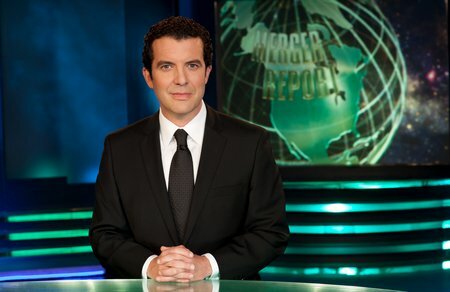 New tonight: Rick Mercer Report, 22 Minutes, The Big Decision, Match Game, Mr. Young | TV, eh? Tonight Rick joins rehearsal for the National Ballet of Canada’s lavish Alice’s Adventures in Wonderland where he tap dances with Mad Hatter, helps play the Cheshire Cat, hangs out with the White Rabbit, and chats with Artistic Director Karen Kain. Then it’s off to Lindsay, ON for a logger sports competition, where Rick joins university and college students hewing logs, wielding chainsaws, and racing up poles with spikes on their feet. Jian Ghomeshi appears on 22 Minutes as guest host; famous illusionist, David Blaine (Shaun Majumder) makes magic happen at Tim Horton’s; Mark Critch shares a laugh with MPs Bob Rae, Thomas Mulcair, Tony Clement and Lisa Raitt at the annual Parliamentary Press Dinner in Ottawa; Movember gets a musical tribute by several well-known Canadian songsters. An Ontario family business and a BC footwear company seek Arlene’s help to thread the needle and resolve their problems. Chris Gorham (COVERT AFFAIRS), Laurie Elliott (VIDEO ON TRIAL), Jonathan Goldstein (NPR), and Meaghan Rath (BEING HUMAN) fill in the blanks with all sorts of blank.